From the late 1960s until recently, Santa Cruz, California was the most politically progressive medium-sized or large city in the United States. An unlikely confederation of socialist-feminists, social-welfare liberals, neighborhood activists, and environmentalists stopped every major development project they didn't like after 1969, and controlled the city council from 1981 through the beginning of the 21st century. Berkeley, Burlington, Madison, San Francisco, Santa Monica — none of them had as progressive a government for as long. By 2010, however, the progressive coalition was in decline due to a lack of burning issues and new ideas to energize it. Long-time activists had accomplished their local goals, and there was no new generation of activists to replace past leaders. The two or three remaining progressives on the city council try to coexist in an increasingly uneasy relationship with three conservatives and one centrist — elected in 2006, 2008, and 2012 — in the name of neighborhood safety. With the threats that developers once posed to neighborhoods (due to their expansionary plans for the downtown and tourism) now safely in the past, the progressives who won office by promising to save neighborhoods are now portrayed as "neglecting" neighborhood issues. This is not only an irony, but it fits with the importance of neighborhoods in understanding challenges to any local power structure. Since most cities are usually controlled by real estate developers and their buddies, Santa Cruz is a good test case for comparing theories of urban power. Atypical cases are helpful in eliminating theories from consideration if they cannot explain the unexpected events. That's why Richard Gendron and I wrote The Leftmost City: Power and Progressive Politics in Santa Cruz (Westview Press, 2009). It concludes that the growth coalition theory of urban power is the one urban theorists should build on because the basic political conflict in Santa Cruz pitted downtown landowners and real estate developers against neighborhood activists, who unexpectedly triumphed because they had the help of faculty, staff, and students at UC Santa Cruz — the most liberal public university in the country — as well as environmentalists who wanted to protect the beautiful coastline from Santa Cruz to San Francisco. We then point out the weaknesses of the three main alternatives to growth coalition theory: public choice theory, urban Marxist theory, and regime theory, which are also discussed on this site. The book has been called "important" and "accessible" for undergraduates, and useful in classrooms because it is "well written and jargon free," according to a review in Teaching Sociology by James De Angelis of Ohio University. Former Cleveland planner and long-time Cleveland State University city planning professor Norman Krumholz, one of the deans of the planning profession, says that it is "brilliant" and "an exceptional book that is a pleasure to read" because it is "written in a way that is clear and lucid, free of posturing and jargon." San Jose State University political scientist Terry Christensen, who has written perceptively on urban politics for 35 years, is almost as laudatory, concluding that the book is persuasive in its critique of the reigning theory of urban politics and "gives us a deeper understanding of politics in American communities." He likes the fact that it introduces students to the four main theories of urban power through the presentation of such an interesting and unique case study — where the underdogs actually won for a change. This Web site can be considered a supplement to that book for those who want to know more about the history of the city and the political leaders who have run it. 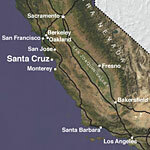 It also provides information on other books and Web sites about Santa Cruz. 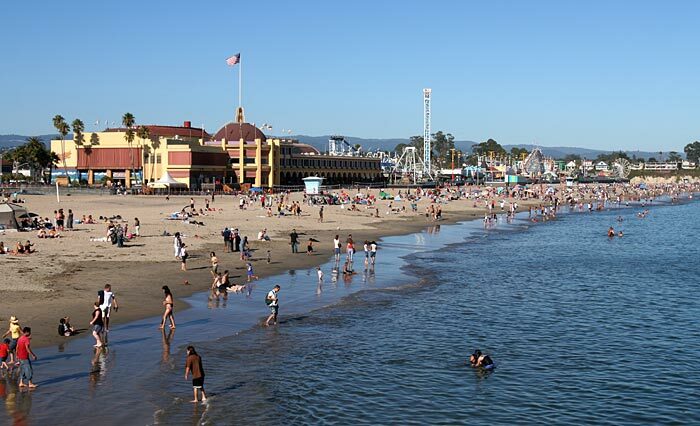 Santa Cruz is a picturesque city of 58,000 people on the Pacific coast, 75 miles south of San Francisco. It may not be paradise, but it's a very attractive place to live compared to many American cities. 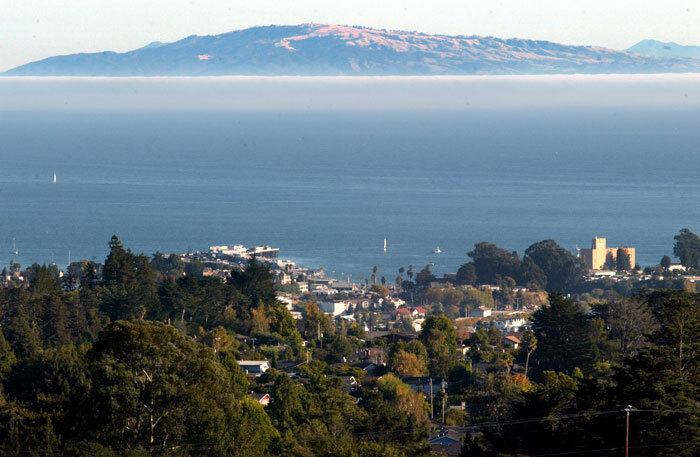 Nestled on a ten-mile strip of coastal shelf land between the heavily forested Santa Cruz Mountains to the north and the shorelines of Monterey Bay to the south, the city has breathtaking vistas from both its hillsides and beaches. The city enjoys an invigorating climate with moderate temperatures year round: no snow or freezing weather in the winter, and very few days in the summer with high humidity or temperatures above 85°F. Most of the rain is in late fall, winter and early spring, leaving many months of the year virtually free of precipitation. The wind can be chilly near the ocean, and the fog a bit depressing when it hangs on late into the day for a week or two, but most days are sunny and clear. Thanks to a fast-flowing river and the heavily forested mountainsides, Santa Cruz had a number of natural assets that made it possible for real estate owners in the little central business district to attract capitalists and workers to the area. 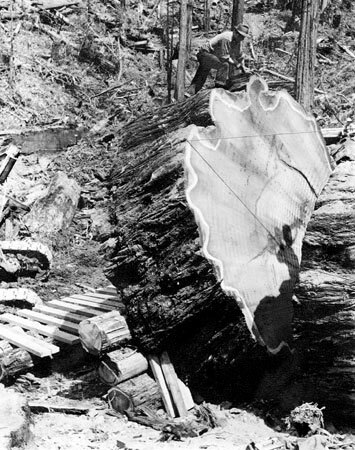 The river currents were ideal for powering lumber and paper mills, which provided a major boost for a timber industry that was profitable first and foremost because of its giant redwood trees, renowned for their beauty, durability, and resistance to decay and insects. An ample supply of madrone and alder trees, which provided a good base for making explosives, brought a manufacturer of blasting powder and gunpowder to an area in the mountains a few miles northeast of the city. 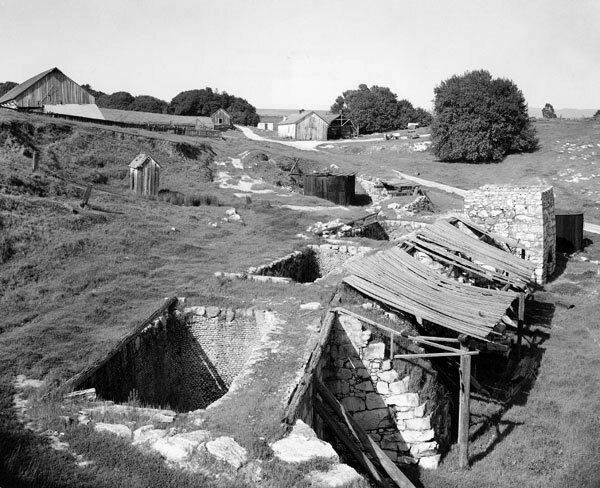 The abundance of bark from tan-oaks — a cheap source of the tannic acid necessary for tanning hides — led to a large tanning industry; by 1870, ten tanneries, making use of hides from the Mission Santa Cruz and the few remaining cattle ranches, supplied half the saddle leather produced in the state. And the limestone in the hills and mountains behind Santa Cruz became valuable because of its role in making plaster and mortar for use in the construction of stone or brick structures, leading to the development of several limestone quarries that by 1880 were supplying more than half of the lime used for construction in the fast-growing cities of San Francisco, Oakland, San Jose, and Sacramento. Because of its beachfront setting, Santa Cruz started to be a tourist destination very shortly after California became a state in 1850, and it has long been known for its laid-back atmosphere and beachfront amusement park and boardwalk, complete with an old-fashioned wooden roller coaster — the Giant Dipper — that dates back to 1924. Santa Cruz is also renowned as a great place to surf or watch surfing contests, earning it a mention in the Beach Boys' 1963 classic "Surfin' USA." 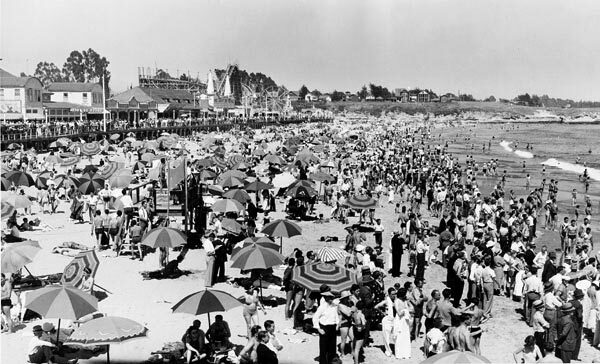 Santa Cruz became a college town in 1965 with the opening of a new campus of the University of California. The local landowners were overjoyed by winning the competition for the new campus; they envisioned huge growth based on new industries that wanted to be near a university. But no new industries arrived. To the landowners' chagrin, the campus became a competing power base, with its faculty, staff, and students providing neighborhoods with the added money, expertise, and leadership necessary to reject or control new real estate developments when they impinged on the quality of local life. The campus became even more of a "Trojan horse" after 1971, when the 26th Amendment granted voting privileges to 18- to 20-year-olds and made an already activist student body into an overwhelmingly progressive voting bloc large enough to swing elections in a pro-neighborhood, pro-environment direction when it could be mobilized. 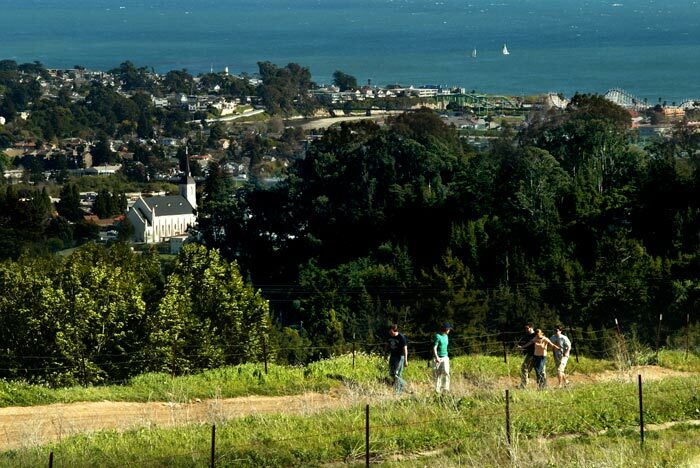 Watch this 8-minute talk, presented at the 50-year reunion of UCSC's "Pioneer Class," that tells the story of the origins of UCSC and how it influenced the city of Santa Cruz. Beyond its atypical power structure, there is another reason why Santa Cruz is an interesting test case: eight years after the progressives finally took control of the city council, they faced an unprecedented challenge when the main business district was almost completely destroyed by a large earthquake that struck the area on October 17, 1989, with its epicenter just 10 miles from Santa Cruz. Three people were killed in the downtown area and nearly half of the downtown buildings had to be torn down, with many others suffering damage that required major repairs. Stunned city residents huddled in grief as they saw the entire downtown core being fenced off. 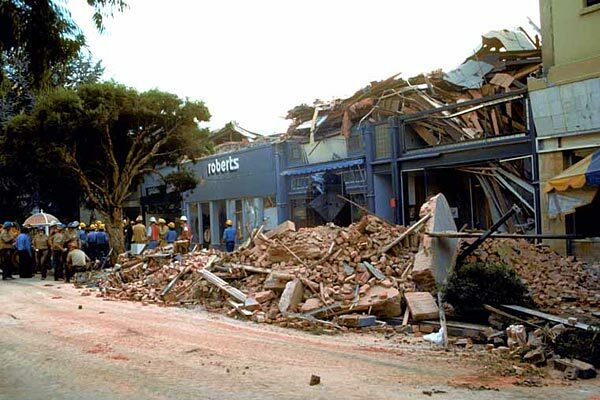 For more photographs of 1989 earthquake damage, see the US Geological Survey's image gallery, which includes a section on the Santa Cruz area. A short video shows some damage through the lens of a TV news crew from San Francisco. For maps and scientific papers on the quake, see this USGS page, or visit Wikipedia for a more general overview. The downtown businesses that didn't go bankrupt or move elsewhere had to move into large tent-like pavilions that were hastily erected on city parking lots just outside the cordoned-off area. In the process, the quake also put power issues on the table once again. It handed the disheartened business leaders what some of them saw as a golden opportunity to regain their political ascendancy by showing how necessary they were to economic prosperity. For the progressives, the disaster was fraught with political danger: they needed to rebuild the downtown in order to have the tax revenues to continue their ambitious social programs, but they feared and distrusted the downtown land and business owners after almost two decades of bitter political warfare. After a long political argument between the progressives and the downtown business community (which is discussed in detail in The Leftmost City), the city slowly recovered in the late 1990s and now has a new Pacific Avenue that is almost as vibrant as the old Pacific Garden Mall. 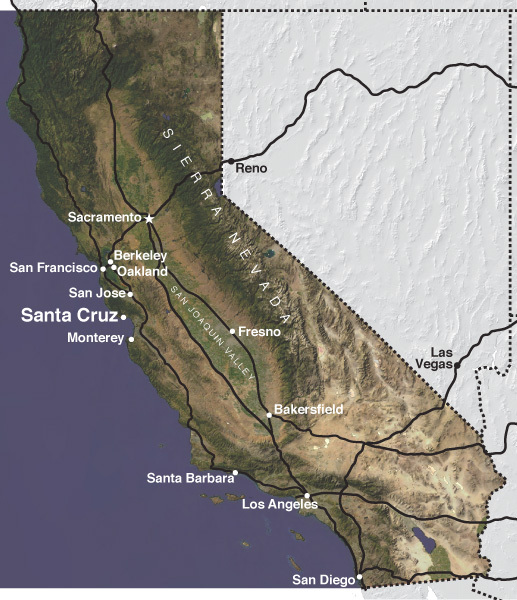 For a more detailed account of the history of Santa Cruz from a sociological perspective, please read the document entitled "The History of Santa Cruz", which leads directly into "Progressive Politics in Santa Cruz".